What Will the X-37B Military Space Plane Do on Its Next Mystery Mission? 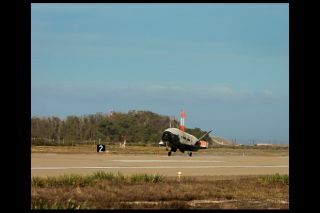 The third mission of the X-37B space plane was completed on Oct. 17, 2014, when it landed and was recovered at Vandenberg Air Force Base in California following 674 days in space. On Wednesday, the United States Air Force's Rapid Capabilities Office is set to launch the fourth mission of the X-37B Orbital Test Vehicle — the military's secretive robotic space plane. The reusable, unmanned X-37B spacecraft will blast off atop a United Launch Alliance Atlas V booster tomorrow (May 20) at 10:45 a.m. EDT (1445 GMT) from Cape Canaveral Air Force Station in Florida. You can see a video of how the X-37B will launch. All three missions landed on autopilot at California's Vandenberg Air Force Base. On this outing, the space plane might touch down at Kennedy Space Center in Florida, although Vandenberg is still being maintained as a landing spot, Air Force officials have said. A photo from a previous X-37B mission shows launch processing of a Boeing-built X-37B Orbital Test Vehicle. The X-37Bis built by Boeing Network & Space Systems, the same unit that designs and delivers satellites used for communications, navigation, intelligence and weather monitoring. The winged vehicle measures 29 feet long by 9.5 feet tall (8.8 by 2.9 meters), with a wingspan of 15 feet (4.6 m). It has a payload bay the size of a pickup-truck bed. Two X-37B space planes have purportedly been built. Which one of those craft will be flying Wednesday isn't clear. "The vehicle cannot be specified for operational reasons," Air Force spokesman Capt. Christopher Hoyler told Space.com. "What I can tell you is that the program selects the orbital test vehicle for each activity based upon the experiment objectives." The Air Force has revealed that it is collaborating with two organizations to evaluate experiments carried on the space plane's upcoming mission. Encapsulated in its fairing, the United States Air Force's X-37B space plane is positioned for attachment to its Atlas V booster. An experimental propulsion system jointly developed by the Air Force Research Laboratory and the Space and Missile Systems Center will be flown. In addition, the X-37B craft will carry a NASA advanced materials investigation. Also catching a ride aboard the Atlas V on Wednesday is the LightSail spacecraft, a solar-sailing demonstrator built by the nonprofit Planetary Society. "Describing some of the activities on this X-37B flight may be meant to lessen its mysterious nature," said Laura Grego, senior scientist at the Global Security Program for the Union of Concerned Scientists, which is headquartered in Cambridge, Massachusetts. Grego told Space.com there is "no compelling reason" provided for why these experiments need to hitch such an expensive ride on the X-37B. "While the space plane isn't particularly well suited to a space weapons role, most of the space plane's details are still classified, and the Pentagon appears committed to continuing the program," Grego said. "So it still seems to be a source of anxiety for some of those concerned about the increasing weaponization of space." Whatever the X-37B's activities may be, Grego said, "we should certainly be concerned about the weaponization of space. In any case, security in space cannot be achieved unilaterally or by developing the best weapons. It really depends on sustained and substantial cooperation among users." Given the clandestine nature of the X-37B missions, how do other nations, such as China, view the program? "I don't think there's any question that the Chinese see the X-37B as a space weapon," said Dean Cheng, a senior research fellow at The Heritage Foundation's Asian Studies Center in Washington, D.C.
Cheng doubts that China sees the X-37B as the end-state. "Instead, I would suspect that they see it as an evolutionary part of a larger space capability, one that will have a larger payload…including more cargo volume than the bed of a pickup truck," he said. It is also useful to note, Cheng said, that the Chinese are interested in reusable launchers. China is probably even more intent on gaining the ability to deploy payloads into space in ways that may be hard to identify from the ground, he added. "It will be interesting to see what measures, if any, they [China] can take to counter 'space-based' space surveillance capabilities," Cheng said. An example of such capabilities is provided by the two U.S. geosynchronous space situational awareness program (GSSAP) spacecraft lofted last year. GSSAP satellites are billed by U.S. military space officials as America's "Neighborhood Watch" program. They observe satellites in geosynchronous orbit and scout for unusual activity — and can sidle up to and inspect other spacecraft. From the U.S. military's perspective, the X-37B is a "chip in the poker game" that officials see being played with the Chinese, and possibly Russia and other nations as well. That's the view from Roger Handberg in the Department of Political Science at the University of Central Florida in Orlando. "Space has been militarized, but increasingly the drumbeat is back to weaponization as the logical extension of military operations," Handberg told Space.com. From a military perspective, Handberg said, "you have to prepare for all contingencies, no matter what they are." The X-37B is consistent with the idea of operationally responsive space, Handberg said. "That's an absolutely necessary ability," Handberg said, "if you assume the Chinese will immediately attack all U.S. military space assets, plus many of the commercial options in communications and remote sensing that the DoD [Department of Defense] uses daily." How rapidly any lost on-orbit inventory can be replenished, Handberg added, will be critical for the U.S. given its dependence on space-based assets for military superiority. "From a policy perspective, the X-37B is also a tool for the space cadets inside the Air Force to demonstrate a little separation from the flyboys who run the service and its priorities," Handberg said. Handberg said the X-37B is a "visible reminder" to all that the U.S. can operate successfully beyond the atmosphere to project American power globally. "And do so in a reusable vehicle whose military potential has not yet been demonstrated, but the imagination can provide several scenarios where the capabilities will be very useful," Handberg said. "Scaling the vehicle up could allow for multiple payloads including nuclear weapons, or simply replacement satellites for those damaged by attack or accident." Leonard David has been reporting on the space industry for more than five decades. He is former director of research for the National Commission on Space and is co-author of Buzz Aldrin's 2013 book "Mission to Mars – My Vision for Space Exploration," published by National Geographic with a new updated paperback version released this month. Follow us @Spacedotcom, Facebook or Google+. Originally published on Space.com.